How To Grow Cabbage | Grow This! 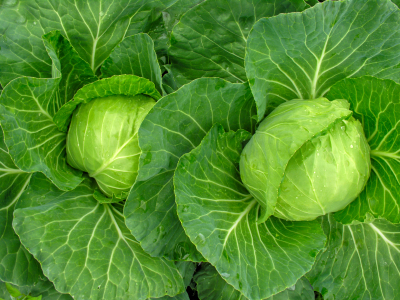 Cabbage belongs to the same family of vegetables as broccoli, kale and Brussels sprouts. While it can be difficult to grow because it needs cool temperatures and often attracts pests, with a little care and attention to detail, you can grow this delicious, nutrient-rich vegetable at home in the spring and the fall. Here’s how to grow cabbage. Like most vegetables, different varieties of cabbage may be better suited to your region than others. They vary in size, taste and color, but most importantly, in tolerance to temperatures and disease, so check with local grow experts to determine which type of cabbage is best for your area. Red and Chinese cabbage tend to be good for fall harvests. “Stonehead,” “golden acre” and “primo” are quicker to harvest. Cabbage needs cool weather in order to be successful. It is best grown in the early spring or fall. Transplants should be moved outdoors 2 to 3 weeks before the last frost of the winter (seeds can be sown indoors 6 to 8 weeks prior to the last frost). For fall planting, sow seeds outdoors 6 to 8 weeks prior to the first frost of the fall. Practice crop rotation. Cabbage should not be planted in the same area two years in a row or where broccoli, kale, kohlrabi or cauliflower has recently grown. Do not plant near broccoli, cauliflower, strawberries or tomatoes. Be sure to choose an area that gets at least 6 hours of direct sunlight per day, though more is better. Cabbage needs very specific soil in order to thrive. Choose a sandy or loamy type of soil and enrich it with plenty of nutrient-rich matter like mature compost, aged manure or organic fertilizer. Test the soil to be sure the pH is 6.5 to 6.8. Be sure the soil drains extremely well. Cabbage can be grown from seed or from transplants purchased at a local nursery. If growing from seed, it is best to sow seeds indoors 6 to 8 weeks prior to the last frost of the winter. Follow instructions on the seed packet. Harden off your seedlings for about a week and then transplant them outside 2 to 3 weeks before the last frost. If direct sowing into your garden bed, follow seed packet instructions and then thin the seedlings to 12 to 24 inches apart once they reach 5 inches tall. Plant transplants 12 to 24 inches apart. When in doubt, air on the side of more space. Bury them deep with about half of the stem under soil. Be sure the soil is well tilled and fortified with compost before planting. Use thick organic mulch to retain good soil moisture and temperature. Cabbage needs regular, even watering in order to thrive. They usually need about 1-2 inches per week. Check the soil often, particularly during dry spells. Keep the soil moist but not muddy. Cabbage should be fertilized about 3 weeks after transplanting seedlings. Fish emulsion or compost tea works well for cabbage. Fertilize again when the plants begin to develop heads. Cabbage is ready for harvest when it feels firm, not when it looks firm. Give it a gentle squeeze to check. This takes about 70 days for most varieties. Some varieties will need to be cut off as soon as they are firm but others can be left on to grow a bit larger without problem. Slice them off at the stem and eat or refrigerate immediately. Do not leave them in the sun. Remove the entire plant from the garden after harvest to avoid disease build up in the soil. Do not compost diseased plants. Cabbage is susceptible to slugs, bugs and other pests. The best way to prevent them is to keep your garden clean and your plants healthy. Remove pests as soon as they appear. Do you have tips or questions about how to grow cabbage? Let us know in the comments section below.